Inadequate dietary fiber is common in the typical Western diet, leading to undesirable health effects on not only gastrointestinal function, but also aspects of cardiovascular, glucose tolerance, and immune system function, as well as weight control. FiberPro provides an array of fiber sources representing all of the important functions of this phytonutrient. FiberPro is also enriched with fructooligosaccharides (FOS), specific prebiotic carbohydrates which are used preferentially by beneficial intestinal bacteria such as Bifidobacteria. 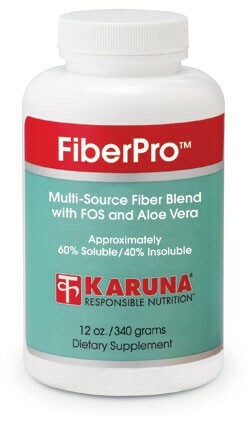 FiberPro provides an array of twelve food fibers, including those with soluble, insoluble, viscous, and fermentable properties, each of which confers valuable health effects (Proc Nutr Soc 2003;62:37-43). Soluble fibers retard the absorbency of dietary carbohydrates, thus aiding in the regulation of blood sugar and insulin (J Am Diet Assoc 1987;87: 1189-97). Soluble fibers bind bile acids and inhibit the absorption of dietary cholesterol, both of which contribute to the regulation of blood cholesterol and lipids (Am J Clin Nutr 1999;69: 30-42). Insoluble fibers act as peristaltic stimulants, hastening evacuation, regulating bowel function and reducing bowel transit time, which minimizes the exposure of colonic epithelium to potentially toxic chemicals (Basic Life Sci 1993;61: 45-63). Special fructooligosaccharide carbohydrates nourish beneficial intestinal microorganisms for optimal ecological balance, cellular health, and immunomodulation in the gut (Biofactors 2004;21:89-94). Gut-associated lymphoid tissue (GALT) and other components of the gut immune system are favorably influenced by interaction with fiber components or with the organisms they support (Br J Nutr 2002;87: S221-30). FiberPro's neutral-tasting granules mix readily with water or juice. Suggested use for adults: Two teaspoons (approximately 10 grams) 1-4 times daily added to 8 oz. water, or to 1 oz. juice plus 7 oz. water. Stir vigorously and drink immediately. Children, 1/2 adult dosage.